Please mind, although some 60% of the population of Baoting County is still made up of the Li People (黎族 ), the number of Miao People in the county is in facts negligible. At most they make up some 4.1% of the local population. For this reason, the name Baoting Li and Miao Autonomous County is in fact deliberately wrongful and only serves to diminish the rights of the Li People. The ″Li and Miao Peoples Fengqing Cultural Village″ is a tourist venue. One of its specialities is an interest in the dying art of of Li Ethnic (Tribal) Tattoos and art which is not highlighted in the more family oriented ethnic ″museums″ such as the upscale 7 Fairies Forest and Resort. The Binglanggu Valley is worse, an ethnic theme park. The architecture and show elements are artificial, however although it is a show, some of the ethnic cultural elements are real. Main treats at ethnic villages are; ethnic food and tastes, rice hulking, rice wine making, dying, weaving, embroidery and other Li and Miao ethnic handicrafts. Minority dress, costumes and assessories. The Sanyuesan Festival is a local Li and Miao festival. It is celebrated in spring, on March 3rd （the lunar calendar）, and provides unmarried young people an opportunity to find their loved ones. On that day, young boys and girls from nearby settlements get together in bright and attractive clothing. They hold hands and sing songs, do bamboo pole dancing, and have their dates in houses that are shaped like boats. If all goes well, at the break of dawn, they give each other a token, and promise to meet again next year. On the seventh day of the seventh month of the lunar calendar, China's traditional day for lovers, Li and Miao ethnic groups offer water sacrifices, which has led to locals organizing a festival to attract tourists and residents to play with water. Catch the local waterfall at Qi Xian Ling (7 Fairies) Natural Hot Springs and Forest Park. In the tropical climate, the festival is very popular among local natives as well as tourist travelers of National and by now also international origins. For more information, please refer to ethnic minorities in Hainan Province. 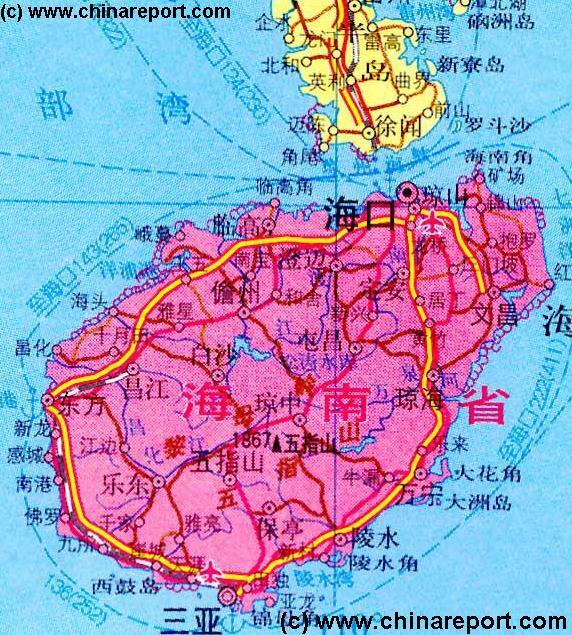 Surface Area: 1166.78 Km2 or 3.42% of the total surface of Hainan Island. Population of Baoting County was 146.864 in the 2010 census. Hailed as a landmark of cultural cooperation with the neighboring Nation of Taiwan, to mainland Chinese still a ″renegade Province″, Ethnic Scenery Street is a 1200 meter long scenic shopping street situated in downtown Baoting Town. The street features traditional Chinese facades in red and gold with tiled roofs and rounded eaves. Supposedly, they also incorporate traits of Li Ethnic Culture. Opened in 2012, to date the street sports some 3 major Taiwanese Brands showcasing their wares. In addition one may try a Taiwanese food experience, drink Taiwanese Liquor and try its rich variations of Tea and so on. All transportation in Baoting County is by road. There is no airport, no train station and no harbor or port. Boating has no station of the Eastern Ring High-Speed Railway, however it has good road connections with both Sanya City and Lingshui County where such stations are available. Main roads in the County are: G224 National Road running basically south to north from Sanya upwards. The S305 Provincial Road which passes through Baoting Town proper. Additional County Type minor roads (marked as X+number) branch off from these two major roads to run into the green forested valleys. In history Baoting County was in majority the land of the ethnic Li People. Today they make up some 60% of the population, whereas the Miao only have a 4.1% share in the population. About 33% of the population is of the Han ethnic group, the majority imported from the mainland. Baoting County was established in the year 1987. It is based on the territory of 6 towns, three state owned farms and also a land reclamaition academy. To find out more information on the history of Baoting, go to: ′History of Hainan Province′. Apart from the main town of Baoting (Baocheng District), there are some 7 main towns within the county. These are: Sandao Town (Sandao Zhen), Xinzheng Town (Xinzheng Zhen), Jimao Town (Jimao Zhen), Xiangshui Town (Xiangshui Zhen), Mao′An Town (Mao′An Zhen), Shiling Town (Shiling Zhen) and Benhao Town (Benhao Zhen). Boating is trationally the poorest county on Hainan Island. However, in the recent decade the tourism industry has brought new income to various parts of the population. Main industries are agriculture and tourism. Agriculture involves rice cultivation in traditional layered mountainside rice paddies. In addition rubber trees and betel nut trees are common. Our pages on Boating Town and County do not contain Hotel Reviews. For an overview of Hotels & Resorts to book in Baoting County, there are three available options. For an overview of Hotels specifically in Baoting County, please refer to below button for information on the nearest available Hotels. Basic information by Hotel, includes map of the area and overview of Hotel locations within that area. For best information, please refer to main page on Hainan Island, section: "climate and weather on Hainan Island". Scenery Street" which is a tourism related cultural street with old styled Chinese Facades and an architecture which purports to be a mix of traditional Chinese, Taiwanese Styles and also Li and Miao styles of building and decoration. If you get to Baoting Town, this is the one location not to miss out on. Sporting a multitude of shops Ethnic Scenery Street offers some unqiue Taiwanese Brands and flavors and would be a good location to start your local experience at. There is NO Harbor in Baoting or Baoting County. The County is land locked. For the nearest large harbor travel south to Sanya City. For nearest beach head eastward to Lingshui Li Autonomous County which has several popular beaches and an abundance of luxury resorts. Airport : There is no civilian airport in Baoting County, nor military airbases or other types of airfields. There are no maps specific to Baoting County available at this Time. 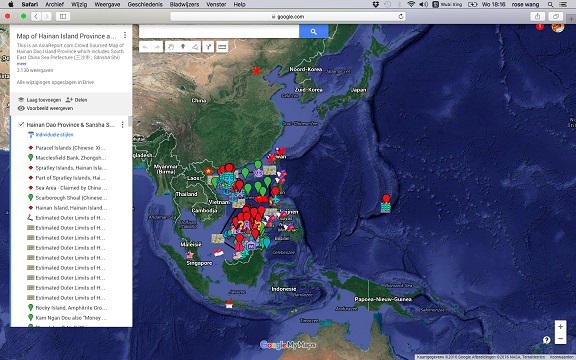 For best options refer to Maps of Hainan Island & Hainan Island Province. Baoting Li and Miao Autonomous County is an administrative unit of the Chinese Island Province of Hainan. It is one of the six autonomous counties found on the Island of Hainan. The County of Baoting is situated on the south-eastern side of the Island, north of Sanya City and City Prefecture and west of Lingshui Li Autonomous County. Baoting Li and Miao Autonomous County is a landlocked county which does not border the sea and therefor has no beaches, harbors and ports. To the north it is bordered by Wuzhishan County and Qiongzhong County both of which are made up by the core mountains and highlands of the center of Hainan Island at heights between 4000 and 6000 feet. To the east lies Lingshui Li Autonomous County which has a long coastline with abundant beaches. To the south lies the large Sanya City Prefecture nationally acclaimed as the number one luxury (beach) resort destination with the Peoples Republic of China. Baoting has no airport, airbase or even an ultra-light airfield. The nearest airport is however Sanya Phoenix International Airport situated at some 46 kilometers to the south-west. Considered an architectural marvel and one of the most luxurious airports in all of Asia, Sanya Phoenix Airport offers a staggering choice of local, National and International flight destinations. 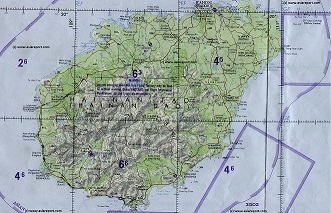 Geographical Relief Map of Hainan Island showing the terrain of the Island. Baoting County is mainly hilly or mountainous. Its main mountain is Diaoluo Mountain. Even higher mountain tops are found ringing the county in Wuzhishan and Ledong. Founded in 1998 at the highpoint of ethnic tourism for mainland Chinese tourists, the Binglanggu Valley is a relatively new tourist zone which builds upon the heritage and legacies of the local Li and Miao Ethnic Peoples. Officially it is registered as a Nature Park but with a mere 5000 acres in surface area it is best seen as an ethnic culture entertainment theme park, a sort of Walt Disney of imagined ethnic cultural traits, themes, dances and other spectacular but rather nonsensical shows and displays. Among foreign travelers it is notorious as the most distasteful ethnic experience to be had in all of the Peoples Republic of China, which really is saying something. Ninglanggu also portends to be an ethnic cultural museum and thus offers a glimpse of local ethnic cultures such as specific foods and handicrafts such as the dying and weaving of clothes, or the production of local rice wine. The Binglanggu Valley is in the south of Baoting Li and Miao Autonomous County in the forested mountains seperating Baoting County from adjacent Sanya City Prefecture. It is situated along G224 National Road at a distance of 7.5 kilometers south of Sandao Town. Distance to Haitang Bay is less than 12 kilometers although the driving distance is considerably longer, it takes no longer than 30 minutes to reach the Binglanggu Ethnic Theme Park from the Haitang Bay Resort Town. For more information on the landmarks and Monuments of Baoting County, please refer to Location: ″Landmarks & Monuments of Baoting County″ via below button. (7 Fairies) Mountains, Yanoda Rain Forest and the Baishuiling Redai Forest Nature Reserve as most popular options. Although tourism is once again booming on Hainan Island. Today, Baoting is not really a popular tourist destination of itself, however plenty of day trippers travel up and down to the few renowned spots in order to escape the beaches and get acquianted with the tropical rainforest and assorted species to be found in the hinterland of the Island. Among these are wild boar, pythons, cobras and the native endangered Hainan Macaque. Former natural treasures such as the Hainan gibbons and assorted species of tropical parrots have already been hunted and sold into extinction. A danger still lurking in the mountains however is Malaria (Plasmodium Falciparum) a parasite which is still holding on in pools of infected animals hidden away in the tropical rainforest reserves. Most victims of the disease are however local farmers and forest workers. The Yanoda Rain Forest is among the most popular and most well visited scenic destinations within Baoting Li and Miao Autonomous County. As its name suggests, the main attraction are the forest covered mountains and the protected trees and wildlife of the rain forest ecology zone altogether covering an area of some 45 square kilometers. The Yanoda Rain Forest represents one of the last remaining old growth rain forest on the entire island, and therefor to explore this realm can be a unique experience. The Forest contains numerous species of plants and animals not found elsewhere in the Peoples Republic of China, most of which by now are endangered and Nationally protected. Nevertheless however, visitors to the Yanoda Rain Forest are invited to climb through the forest following pre-designated paths, enjoy white water rafting, zip lining and also climbing experiences. Easily reached for a day trip from either Sanya or Lingshui, both well overdeveloped with luxury tourist resorts, the Yanoda rain forest sees a busy daily traffic of tourists hiking up and down its mountains. It is really more alike an ecology entertainment zone than truly a protected natural habitat area. Do not expect to see much of the protected animals species as they are scared off by the continuous chatter and shouting of passing tourists. The most coveted scenic spot within the Yanoda Rain Forest is the Sandao Waterfall. For those eager to stay and fully explore the mountains and the many pathways there is a five star resort hotel within the Park. The Rain Forest extends south and west of Sandao Town (Sandao Zhen). Distance from Sandao Town to the entrance is some 2 kilometers. When traveling from Sanya follow G224 National Road northward and up from Sanya City. Take the turn off at Sandao Town. When traveling from Baoting Town, follow S305 Provincial Road westward, then turn south following G224 National Road to Sandao, altogether a drive of some 25 kilometers. Is a so called (Volcanic) Karst Stone Landscape such as may also be found at Halong Bay in Vietnam, Puerto Princessa in the Philippines, in Yunnan Province of China, Jingtai County of Gansu Province (Baiyin Prefecture) along the Yellow River (Huanghe) and other locations in mainland China (P.R.C.). For proper comprehension, a karst landscape is a landscape of heavily eroded lock layers which over time eroded by acidic water (rain in this case) form sharp peeks, ridges and steep ravines and also hidden sink holes and caves. As Hainan Island has been shaped by volcanic activity, the eroded rocks in case are of volcanic origin creating a spectacular ash gray landscape mostly of the Kegelkarst sub-type of landscape. Kegelkarst is a type of tropical karst terrain with numerous cone-like hills, formed by cockpits, mogotes, and poljes and without strong fluvial erosion processes. This terrain is found in Cuba, Jamaica, Indonesia, Malaysia, the Philippines, Puerto Rico, southern China, and Vietnam. The Xian′An Karst landscape is unique for this island and therefor a recommendable destination to go and check out. As local travel guides will have it: ″Xian’an Stone Forest is a manifestation of the uncanny craftsmanship of the Mother Nature. With the crustal movement for thousands of years and weathered by wind and water, here formed a sheer karst landform. Strolling in the stone forest is as if you enter a human fairyland. The living stone sceneries look like the tiger, leopard, dinosaur, fairy, eagle and camel, which are perfect for daydreaming″. YouTube Video: China Central Television: Nature and Science Documentary on the Rain Forests of Hainan Island. and cloudy hills but in addition having geothermal activity which provides for natural hot springs. As a result, the 7 Fairies park is not only a protected natural area but is also regarded as a luxury health resort destination. Various different hot springs can be found within the park including a Hilton DoubleTree Resort, each offering a luxury health bathing experience to visitors. Temperatures in the many different hot springs range from 25 to 90 degrees Celsius and the waters of these springs are said to contain many healthy trace elements including sodium bicarbonate (kitchen salt). of Hainan. According to the park its preserves some 1000 different species of plants and 500 species of animals including (Hainan) macaques, wild boars, pangolins, weasels and pythons; among which there are more than 10 kinds of rare species listed under national protection. Thus, the park promises to offer the traveler a unique chance to experience a world resembling (some) of what the island originally looked like before major inhabitation and agriculture changed the landscape and eliminated most of the precious species from most locations on the island. The Qi Xian Ling Park is also renowned as a destination for climbers. All climbers, from beginner level to avid mountaineer can try their own challenge. The most difficult one leading up to the highest peak. The park gets its name from the surrounding mountain peaks which together are known as the Seven Fairies. Mountain peaks of the 7 Fairy mountains go as high as 2300 meters and higher. The range is an excellent place for both experienced and ‘green’ mountaineers with aspirations of reaching the peak. There’s a sightseeing platform at the 850-meter mark, and climbing is as easy as walking 3770 steps to the top. Climbing season is from November to April, whereas climbing in the park closes down during the rainy season (monsoon) as the paths and mountain sides within the park become to dangerous. Apparently there is a yearly held ″water festival″ during which tourists can go wild spraying and splashing eachother with water. Is a large forested mountain area popular among tourists and locals for ecological recreation. The area is situated in the region between Baoting County and adjacent Lingshui County more to the east and is essentially a mountainous and forested area where weary mainlanders can come to enjoy something of the healthy air, surrounding nature and unexpected wildlife. Among the main activities are hiking and bicycling and the mountains of Diaoluo are usually included in the Tour of Hainan bicycle race vent. For more information, please refer to ″Landmarks and Monuments of Lingshui Li Autonomous County″. Is officially a part of the larger Diaoluo Mountains Eco Tourism Area. It is large tropical forest area which visitors may explore. The Baishuiling Forest is a renowned destination for photographers and bird spotters with an abundance of extremely rare tropical bird species hiding in the foliage of the forest. Assorted species mentioned are; Blue-bearded Bee-eater (Nyctyornis athertoni brevicaudata), Oriental Dwarf Kingfisher (Ceyx erithacus), Oriental Honey-Buzzard (Pernis ptilorhynchus orientalis), Black-browed Barbet (Megalaima oorti faber), Grey-chinned Minivet (Pericrocotus solaris griseigularis), Chestnut Bulbul (Hemixos castanotus castanotus), Mountain Bulbul (Hypsipetes mcclellandii similis), Grey Wagtail (Motacilla cinerea), Large-billed Leaf-Warbler (Phylloscopus magnirostris), Hainan Leaf-Warbler (Phylloscopus hainanus), Oriental Magpie-Robin (Copsychus saularis prosthopellus), White-crowned Forktail (Enicurus leschenaulti sinensis), Spot-necked Babbler (Stachyris strilolata swinhoei) and yet other species. If you are not an ornithologist, just remember it is best to stay quiet in order see the most wildlife. Bring a camera and patience. Catch up on species later by buying a book and looking them up. Or check via adjacent available banner of WEGO.com.